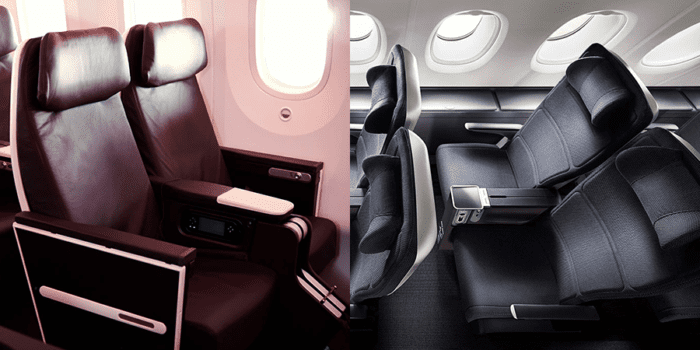 British Airways Premium Economy vs Virgin Atlantic Premium Economy – What’s Best? British Airways and Virgin Atlantic are fierce rivals and in this article we are going to review British Airways Premium Economy vs Virgin Atlantic Premium Economy. You can read our review our comparison of their economy cabins here. Choosing to fly British Airways or Virgin Atlantic can be hard, especially when they are neck and neck when it comes to fares. In this article I am going to compare both airlines with British Airways World Traveler Plus cabin (Premium Economy) and Virgin Atlantic’s Premium Economy and I will be answering the ultimate question: Is the extra money worth it and who should you fly with? 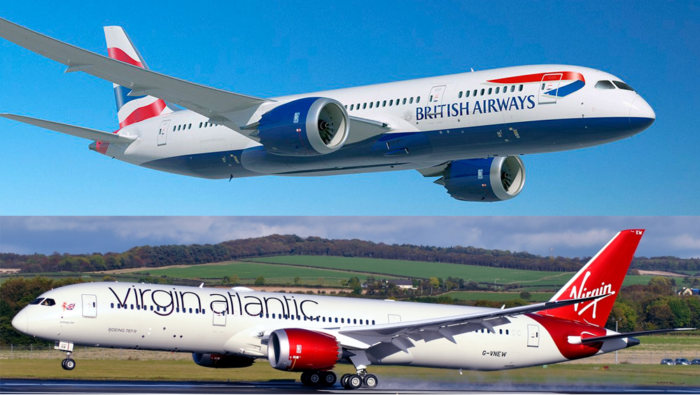 A British Airways 787 Dreamliner and A Virgin Atlantic 787 Dreamliner. Having flown both British Airways World Traveler Plus cabin and Virgin Atlantic’s premium economy cabin tens of times across the Atlantic, I am going to be comparing pricing, seating and comfort, service, food and drinks, entertainment. British Airways: £880/$1152. Virgin Atlantic £432/$565. British Airways: £1647/$2517. Virgin Atlantic £913/$1182. British Airways: £1630/$2315. Virgin Atlantic £1308/$1715. British Airways: £1718/$2250. Virgin Atlantic £1718/$2250. Hint: The Chase Sapphire Preferred® Card card will give you $625 back on $4000 of travel spending within the first three months. This is already more than half of what it takes! British Airways: £963/$1261. Virgin Atlantic £845/$1106. British Airways: £1432/$1875. Virgin Atlantic £845/$1106. British Airways: £877/$1148. Virgin Atlantic £688/$875. *Prices as of June 28th 2018. As you can see from the above results for the random dates searched Virgin Atlantic is better when it comes to premium economy pricing. However – these findings do not take into account reward flights in premium economy which always tend to cost the same amount of miles + taxes in both British Airways and Virgin Atlantic. If you would rather be one of the lucky passengers enjoying a reward flight, learn about how you can save on travel with our SimpleFlying travel rewards cards comparison. 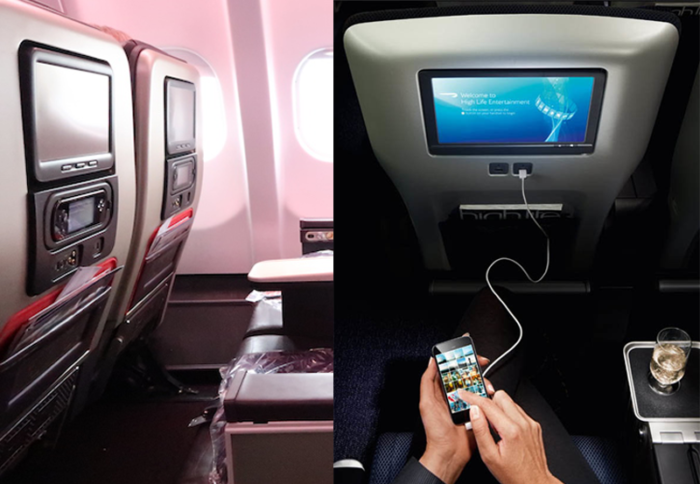 This is where the game really heats up between British Airways World Traveler Plus and Virgin Atlantic’s Premium Economy. Both seats are comfortable for long haul flying – there is more leg room than you need on both seats which make them both very nice. The recline on both seats is also good, and both seats are great for sleeping. With that being said, Virgin Atlantic’s seat is 2.5 inches wider, although that does not seem like a lot – this makes Virgin Atlantics premium economy seat wider that British Airways Club World business class! This makes a huge difference – I would compare sitting in Virgin Atlantic’s Premium Economy to having a nice armchair, whilst BA’s premium economy just feels like a good upgraded economy seat. Overall I would have to say that Virgin Atlantic wins by a long shot due to their seat width – I can’t put into words how much difference it makes on a 10 hour flight. Rating the service is a hard one. Some of the best service I have ever had has been on British Airways, however more often than not the service can be lacking – it really depends on what crew you get. Virgin Atlantic on the other hand tends to be more predicable with great service all of the time. When boarding both British Airways and Virgin Atlantic premium economy you will be offered a pre-departure drink. British Airways offer a choice of juice, water and champagne. Virgin Atlantic offer a choice of juice, sparkling wine plus a bottle of water. 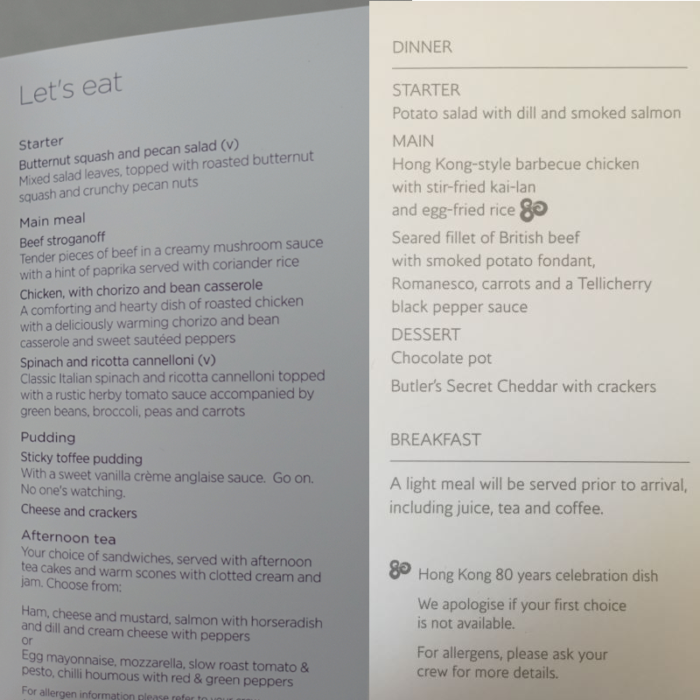 On most flights with both British Airways and Virgin Atlantic you will be served a main meal with a full bar service followed by another meal/afternoon tea before landing. You will also be served drinks both alcohol and non-alcoholic throughout the flight. This is where Virgin Atlantic goes the extra mile! They have a fully loaded help yourself snack bar for Premium Economy passengers. They call this snack bar the Wanderwall. You will find drinks, snacks, sandwiches and ice cream! Yes you read that right, ice cream! Another little bonus with Virgin Atlantic is that they hand out small packs of love heart sweets before landing. A nice way to end your flight for sure! 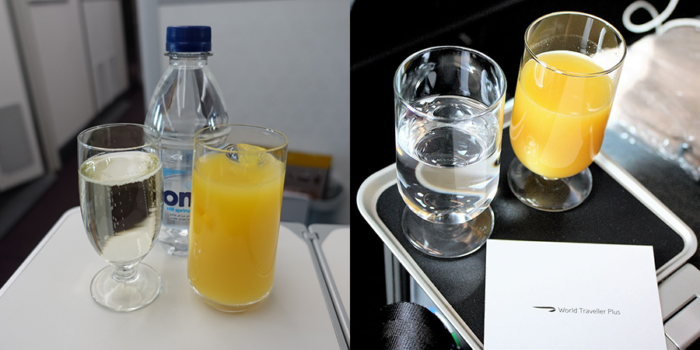 Overall, food and drink is very similar on both British Airways World Traveler Plus and Virgin Atlantic Premium Economy. However with the addition of the Wanderwall in Virgin Atlantic – I would say Virgin Atlantic wins this! Onboard entertainment is great on both British Airways and Virgin Atlantic, there is tons of choice and the screens are of a good size. You can see what’s on British Airways here, and Virgin Atlantic here. In terms of Wifi, both British Airways and Virgin Atlantic are slowly rolling out Wifi across their fleet and prices on both airlines for wifi start at £4.99. I recommend contacting the airline you’re flying with before hand to see if Wifi is onboard your flight so you can get a Netflix watchlist going! Time for me to answer this killer question that everyone wants to know. In my experience premium economy is worth it if it’s less than 2x the price of an economy ticket. If it’s more than this I would rather save the money and spend it at my destination. More often than not, premium economy tickets are priced below this so I would say its worth it. I especially love premium economy on overnight flights – sleeping gets a lot easier with more recline and comfort and it can mean the difference between bad jet lag and no jet lag at all. You will feel great with the extra space, especially on 10 hour+ flights and everything is going to be better than economy in terms of food, service as well. Up to 100,000 Avios sign-up bonus. Earn 3 Avios for every $1 spent on British Airways purchases. Earn 1 Avios for every $1 spent on other purchases. Should I fly with British Airways or Virgin Atlantic? My first choice is always going to be Virgin Atlantic. Why? The seats are more spacious and that in itself does it for me. Even if premium economy is a hundred pounds/dollars more expensive than British Airways World Traveler Plus I would choose Virgin. And of course, I can always make up a lot of the difference through credit card rewards when booking on one of my favorite travel rewards cards. See our comparison here. However, British Airways do operate more routes than Virgin Atlantic – so obviously if you’re considering flying premium economy and Virgin Atlantic don’t operate the route – then I wouldn’t hesitate to book British Airways World Traveler Plus as long as the price is right. I hope you enjoyed this comparison! If you think I have missed anything or if you want to share your own experience with either airline flying premium economy do comment below! I enjoyed your assessment and agree with you entirely. Virgin Premium is streets above BA!